This massive 70 hectare park has a lot to offer. 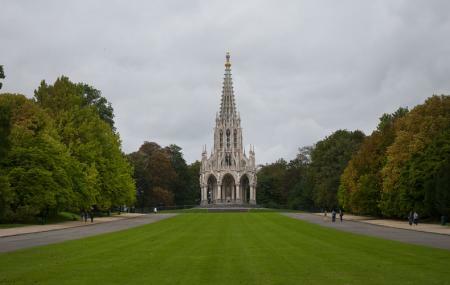 At the very centre of the park is the flamboyant Gothic statue monument to King Leopold I. To the east are the Royal Greenhouses of Laeken, and to the south-east, the Castle of Laeken. Natural beauty abounds: winding trails, groves of trees, undulating lawns, sparkling streams and ponds. The Park is inundated with splendid flowers like magnolias, daisies, rhododendrons and jasmine and become a sight to behold when they bloom. And the trees! Chestnuts, conifers, ash, yews, hawthorn, beeches and maples! It is said this is the most English of Brussels’ parks. The best panoramic view of the park can be enjoyed from near the monument. Surrounding the park are other places of interest, for example, the Chinese Lodge and the Japanese Tower gardens. How popular is Park Laeken? People normally club together Atomium and Océade while planning their visit to Park Laeken. A must see when visiting Belgium. The tulips in the back ground. And the water fountain under the main statue. With each statue telling his own story and everyone calmly minding there own business. What a lovely place. Loved it! A very large park and a great ecosystem, in whiche there live a lot of wild rabbits, ducks, pigeons and other animals. It is a must see! Nice place. Have electric for charge the mobile phone. And they have a toilete in the park. In addition they have a for rain a place to stay. Nice place to take a walk! The memorial of Leopold 1st in the middle of the park is really impressive!